"Imagine you love your country so much that you are willing to die for it, you are so devoted to your faith that you never recant it, even under torture, and your love of learning and education is so strong that you are willing to study and teach underground in the face of possible imprisonment because your own government bars you from university." 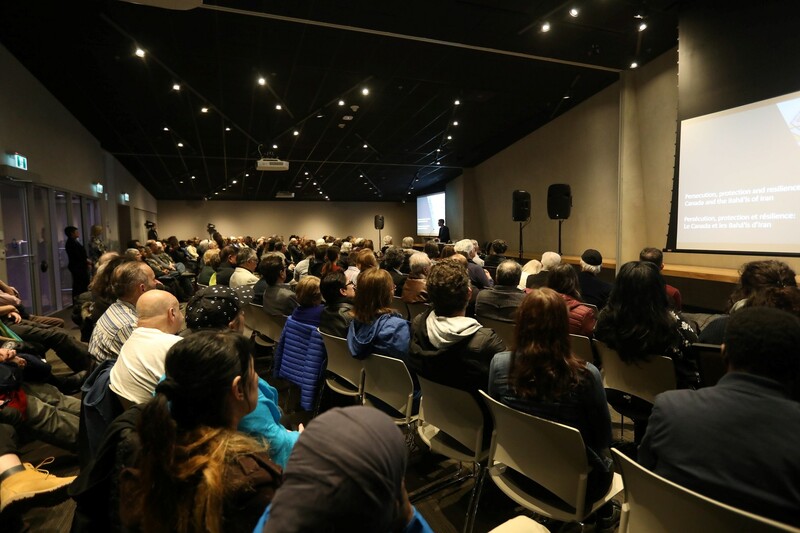 This is how Maziar Bahari, an Iranian-Canadian journalist and filmmaker, began his keynote lecture to a capacity crowd gathered on March 26th at the Canadian Museum of Human Rights in Winnipeg. "This has been the Baha'i experience in Iran for the past 40 years," he explained. Bahari was a journalist for Newsweek from 1998 to 2011, and he was imprisoned and held in solitary confinement by the Islamic Republic of Iran for 107 days in 2009. He was jailed because of his reporting, a story he told in a bestselling memoir and which was portrayed in Jon Stewart's film, Rosewater. Since being released from prison, he has drawn attention to the persecution of Baha'is in Iran. "For me, a non-Baha'i Iranian, the arrest and murder of my Baha'i sisters and brothers is a shameful chapter in Iranian history. It is also a stain on our collective conscience as Iranians," Bahari told the audience of some 200 people. "The outstanding example of [the] progressive Baha'i outlook is their approach to higher education," Bahari said, noting that the Iranian government has banned Baha'is from teaching or studying at universities. "Instead of submitting to suppression, they chose a beautiful form of peaceful resistance by starting their own university, the Baha'i Institute for Higher Education (or BIHE), in 1987." 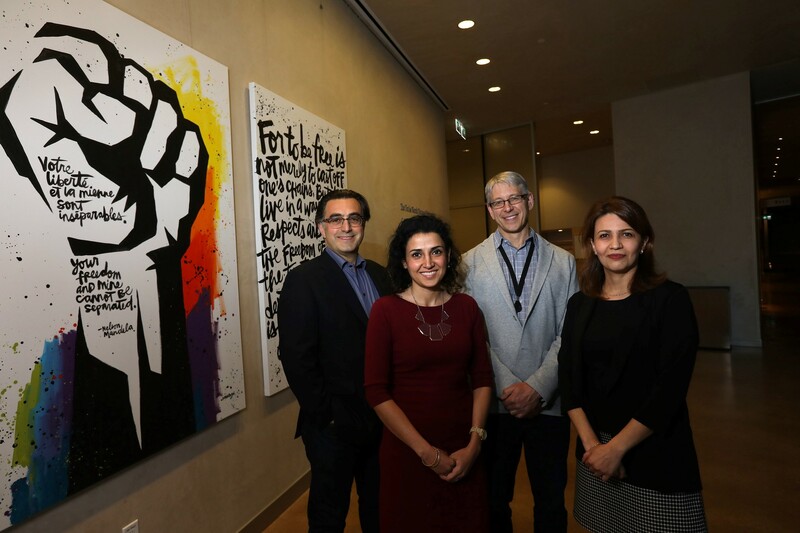 After Bahari's lecture, he was joined for a panel discussion with Afsoon Houshidari (a refugee lawyer, and former child refugee), Dr. Farnaz Raeisi (BIHE graduate, and post-doctoral fellow at the University of Manitoba), and Dr. Geoffrey Cameron (Director of Public Affairs, Baha'i Community of Canada). Houshidari opened the evening with a moving performance of a monologue depicting the story of her family and her journey as a child fleeing post-revolution Iran, in the midst of violent attacks on Baha'is. She has performed her story at events hosted by the United Nations and before members of the US Congress. During the panel discussion, Dr. Raeisi captivated the audience with her description of studying in informal settings created by the BIHE in Iran. Despite repeated raids and attacks by Iranian authorities, more than 10,000 students have completed degrees with the BIHE. It offers 38 university-level programs across five faculties, with about 750 affiliated faculty. The New York Times has called it "an elaborate act of communal self-preservation". Dr. Raeisi studied civil engineering with the BIHE and was later awarded a doctoral fellowship to study at the University of Manitoba. She described the emotions of walking into a research library, and being surrounded by thousands of books. In Iran, most of her materials were digital books, studied in small groups and in the privacy of her home. She described how overwhelming it felt to be surrounded by books, where she could stay and study to advance her education. The presentations invited profound questions from a diverse background, many of whom had heard about the event from extensive media coverage in the days leading up to it. Global News, CTV-Winnipeg, CBC, Radio-Canada, and the Winnipeg Free Press carried stories featuring Bahari and Houshidari in the days leading up to the event. Photos courtesy of the Canadian Museum of Human Rights.